The place to discuss haplotype FGC5494. FGC5494 is a single nucleotide polymorphism (SNP). It is reported as being circa 2400BC. Mike Walsh has a project at Family Tree DNA (FTDNA) with a SNP tree which is for R1b-L21 haplogroup men who have tested their yDNA. Mike is the administrator of this project. FGC5494 is placed in this tree. Many of the Fitzpatricks who have tested yDNA are also in differing parts of this SNP tree. 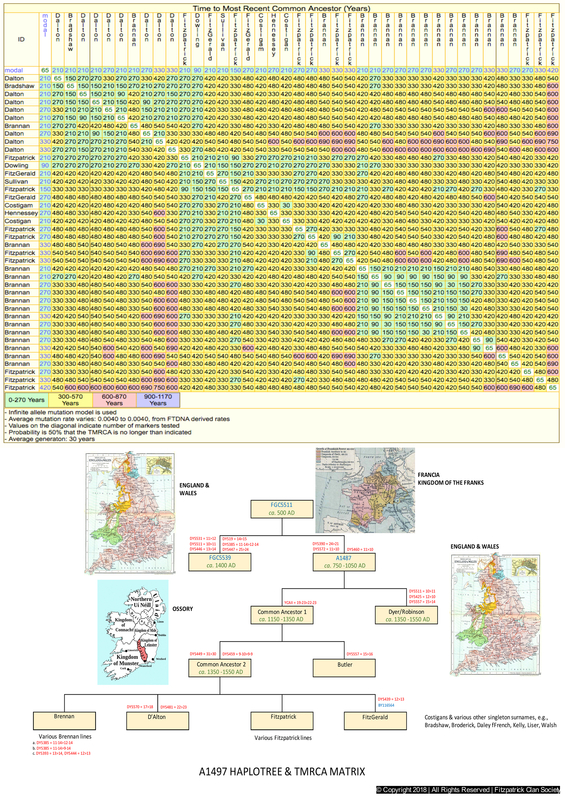 I hope we can have more of the Laois and Kilkenny Fitzpatricks to test past their most commonly reported haplogroup of R-M269. They could upgrade with a FGC5494 SNP pack, STR111, and or a BigY test. By doing so we can bring the group into better focus and at the same time bring the terminal haplogroups into the more recent past when surnames become the norm. Another project at FTDNA is the FGC5494 and Subclades project. I find myself joining as many projects as I can that are relevant for my surname, ethnicity, haplogroups and terminal SNP. I believe the more the merrier. Tim we all know what an important group FGC5494 is. We need to get our heads together and figure out a strategy for further testing. I'm sure we can find some funds rot regularly test FGC5494 Fitzpatricks for key SNPs, such as A1487 and/or A1488, because the tests are only USD39 at FTDNA. I believe two people have decided to do the FGC5494 SNP pack test. I am excited about this. I think it is a great offer for the Clan Society to fund some testing. If there is anyone interested or if anyone knows of a good candidate please let me know. Tim if you find the candidates the Society will fund one SNP test per month for them. I think A1488 is the way to go for now because you and Fitzgerald share that. One there are a few more BigYs in there that might change though. Robert Fitzpatrick has his results returned for the BigY. Thanks to the project for the gift to Robert and the chance to see how the Ossory Fitzpatrick's are connected. Robert's results have confirmed that the FGC5494 SNP is a branch SNP that is common for the Ossory DNA group. These are brave words. But we also have Peggy Fitzpatrick and Richard Costigan returning FGC5494 SNP pack tests that indicate the same result. The DNA testing at 37 STR markers is showing a connection. That is old testing and I submit out of date. It would be good if all the members of the Fitzpatrick DNA project could upgrade their results as cost permits. Mike , Ian and myself are good to discuss how best to spend monies for the best result.